We only have experience of this deformity for adult patients. This deformity may be painful not only on the corresponding short ray but also on adjacent metatarsals that have a relative excessive length. In adults, lengthening of the brachi metatarsal is not a good solution. We prefer to shorten the other rays not quite as far as the short metatarsal, but trying to get a compromise which respects the rules of a correct metatarsal relative length and metatarsal parabola. This technique will relieve pain, preserve the cosmetic appearance and take into account the length of the contra-lateral foot for footwear. Fig. 38a. Congenital brachi metatarsal 1. 1, 2, 3. This deformity may be painful on the corresponding short ray (dorsal flexion of the toe, painful MTP joint) or mostly on the adjacent rays: In this example metatarsalgia on the third ray. Since our cases are not adults, we do not lengthen the short metatarsal. On the contrary it is easy and harmless to shorten the other metatarsals. 4. Our aim is to reestablish as far as possible the metatarsal parabola. 5, 6. One example of brachi metatarsal on the second ray: We shorten the four other metatarsals: Excellent result. 7, 8. Brachi metatarsal on the fourth ray and the treatment. 9. Shortening of three rays. Severe Forefoot Disorders joint preserving surgery instead of traditional joint sacrificing procedures. Fig. 39a1. 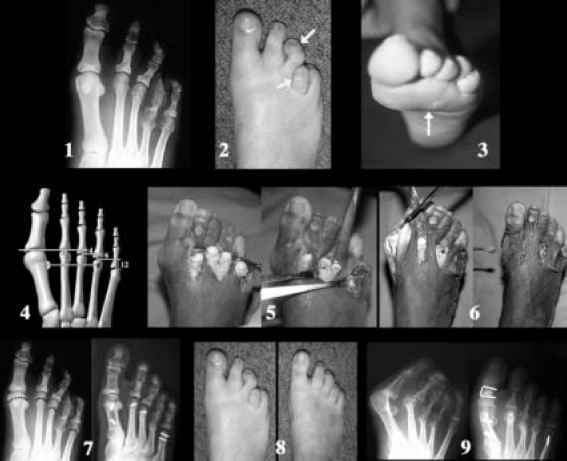 Severe forefoot disorders - Current radiological and clinical aspects. Fig. 39a2. Severe forefoot disorders. Some current procedures which can be avoided now. 1. Keller procedure or first MTP prosthesis, PIP resection arthroplasty on the lesser toes. 2. "Systematic" first MTP fusion and lesser metatarsal resection (we perform these procedures but in limited indications). 3. Disorders resulting from anarchic metatarsal head resections. 4. Among these procedures, we have to distinguish the Regnauld's technique (that we made before the Weil osteotomy), which can provide good result while preserving the lesser metatarsal heads (enclavement). However it is unpredictable concerning the blood supply of the metatarsal heads, and on the other hand the shortening of the first metatarsal was not performed (only the first phalanx shortening). So this procedure was indicated above all in case of index minus metatarsal formula. Ten years ago, we were perplexed when a patient came in consultation with painful severe forefoot disorders. 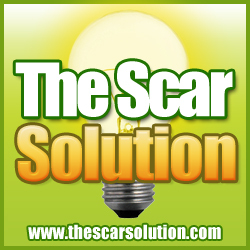 Now, we are not only embarrassed, but we can offer our patients joint preservative solutions, with a painless postoperative period and notable functional recovery. So, faced with the anxiety of such patients, often already operated several times, we can now bring a peaceful and confident glance for both reassure the patients and treat correctly its severe forefoot disorders. Our decisive case was performed in October 1993 (Fig. 39a3). We were surprised when we observed the good results, first immediately in the postoperative period, then year by year and at last with six years follow-up. This case encouraged us to continue in this therapeutic way. The key to the severe forefoot disorders treatment is certainly the longitudinal decompression provided by the large and harmonized metatarsal shortening. The amount of metatarsal shortening is assessed clinically and radiologically. MTP passive dorsal flexion with a maneuver trying to correct the intermetatarsal angle and the hallux valgus deformity. In case of loss of MTP dorsal flexion, the first metatarsal shortening is indicated: However, a more accurate assessment is made intraoperatively after MTP lateral release and M1 medial approach. We usually observed that 1/2 cm M1 shortening increases the MTP dorsal flexion up to 30°. Radiographically, we observed that both good correction of the hallux valgus deformity and improvement of the MTP are obtained when shortening is up to the X-ray level of the most proximal part of the first phalanx: It is the ms point noted in many pictures of this book. In cases where the shortening is less, the result is insufficient. This is reliable whatever the considered ray (first ray, lesser rays). This may be assessed on dorso-plantar X-ray views but also in the medial oblique view. This ms point is useful for the assessment of metatarsal shortening in the following cases: MTP dislocation, severe hammer or claw toes, or lateral deviation such as lateral wind-swept toes deformities as well as advanced hallux valgus deformity. Fig. 39a3. Our deciding case to preserve MTP joints in severe forefoot disorders. In October 1993, I attempted for the first time to correct this severe forefoot disorder, while preserving the MTP joints, thanks to the shortening of the metatarsals (scarf and Weil osteotomies). In this picture we show the results six years after this procedure (October 1999). This case was deciding to carry on such joint preservation in severe forefoot disorders. We observe that this result is obtained with the following amount of shortening: the remaining first metatarsal lenght is located on the basis of the proximal phalanx of the great toe in the P reoperative X-ray: this is the ms (Metatarsal Shortening) point. In this case, we observed that the hallux valgus correction is stable as well as the correction of the MTP dislocation of the lesser rays. Nevertheless, we also observe that the second metatarsal remains too long: Secondary we performed PIP resection arthroplasty on the second toe, which is not a good procedure. We also observe that the great toe remains too long: Now we avoid these problems. Fig. 39b1. 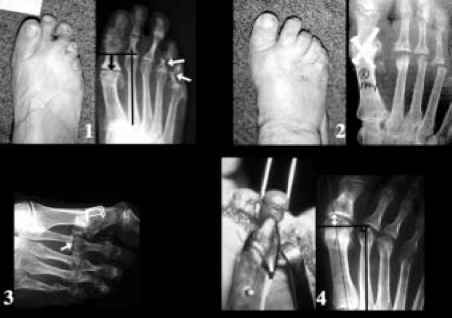 Severe forefoot disorders - Longitudinal decompression by shortening of the metatarsals: Surgical principles. 1, 2, 3. First metatarsal shortening by M scarf osteotomy with the Maestro technique, which increases the fragmental contact and preserves the TP lateral ligament. This results in longitudinal decompression of the MTP joint (3) which allows the correction of both severe hallux valgus and impaired MTP joint. 4, 5. 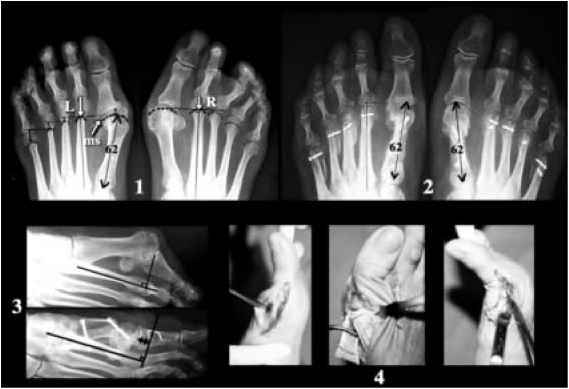 Weil lesser metatarsal osteotomy provides a predictable and reliable shortening of the metatarsals while preserving the head with its blood supply. 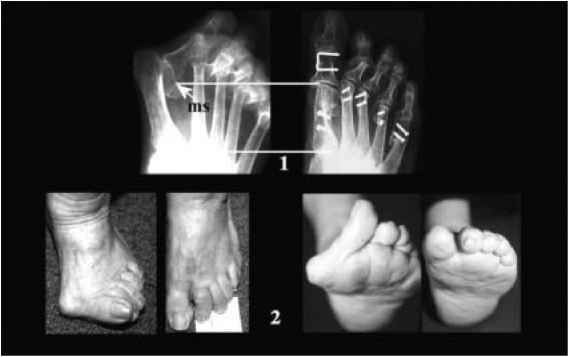 The resulting longitudinal decompression allows relief of metatarsalgia as well as correction of any toe deformity. 6, 7. In MTP dislocation, the proximal sliding has to be as large as the metatarsal phalangeal over ridding (ms point). We observe that the best results were obtained with these two conditions: Large and harmonized shortening of the metatarsals. Fig. 39b2a. Severe forefoot disorders - Management when the lesser rays are the most impaired. 1. In this case, the most impaired or deformed ray is the second one. 2. So we focus the surgery on this ray (it is the most common impaired ray): Shortening as far as to obtain the correction of the MTP dislocation (Weil osteotomy). 3. 4. Then harmonizing the other metatarsals (in this case particularly the first one). Fig. 39b2b. Severe forefoot disorders - Management when the first ray is the most impaired. 1, 2. The amount of shortening (ms point) is determined from the first metatarsal of the left foot, but is applied on contra-lateral foot: We observe that this shortening, which allows preservation of the MTP joint, is finally almost the same as for the MTP fusion of this joint; good result with this amount of shortening. 3, 4. Recovering of the MTP dorsal flexion needs to shorten the first metatarsal.